My best burger recipe shows you how to make German hamburgers from ground beef, ground pork, and a few other secret ingredients. Easy burger recipe! I was born and raised in Munich, Germany. So I ate a lot of German hamburgers during the first 30 years of my life. Then I emigrated to America, where I still eat a lot of burgers, usually from Fran's Hamburgers in South Austin, Texas. They know how to make a juicy patty. Yummers. However, I miss the crusty goodness of my own best burger recipe - German Frikadellen, Buletten, or Fleischpflanzl (as they are called in Bavaria). They also have a lighter, fluffier interior due to the addition of eggs and cracker meal. Nicely-browned onion and garlic, as well as a good portion of freshly-chopped parsley together with a generous helping of (honey) mustard give these patties an amazing flavor profile. A couple of years ago I helped open a German restaurant in the Texas Hill Country. We made and sold a ton of German hamburgers, and people ordered them with a variety of traditional German side dishes such as mashers, sauerkraut, red cabbage, Spaetzle, French fries, German potato salad, Jaeger Sauce and, of course, a fresh pretzel. The following video demonstrates the mixing, shaping and cooking of this German food specialty. Our restaurant batches were pretty big---the recipe yields about 24 half-pounders---but you can easily adjust it to your desired amounts. Simply divide the ingredients by 2, 4, or 8. I recommend that you always make more than you need for one meal. Why? These German hamburgers are fabulous when eaten cold with some mustard, pickles, and crusty bread. Of course you can quickly reheat them in the microwave, too. This restaurant-size recipe for 24 half-pound patties requires a stand mixer (or a couple of pro-wrestlers) for proper mixing. Divide it by half, and you can easily do it by hand in a large salad bowl. Prep: Fry 2 cups of chopped onion until translucent and slightly brown; add 3 tablespoons chopped garlic and cook for another 2 minutes; add 1 cup chopped parsley and cook for 30 seconds; take the mix off the heat. Shape your patties and pan-fry them to a dark-golden brown. Or, if you have a fryalator at home, by all means - use it. 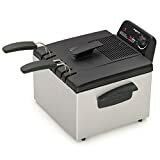 It's a lot faster, and if you use a double-basket fryer, you can either supply a larger crowd faster with fresh German burgers, or you can simultaneously cook up some French fries. Below I introduce you to the electric deep-fryer we've used in my Bavarian Bistro food trailer, where it took quite a beating and kept on ticking. Very nice product! In addition, I recommend that you look into getting a spider tool (for fishing the burgers out of the hot oil) and a practical French fries cutter. Do you have the right tools for a German hamburger party? Stainless Steel Dual Basket ProFry immersion element deep fryer - Professional style deep fryer with dual baskets. Fries two foods at once or extra large batches. you may want to look at my Jaegerschnitzel recipe! 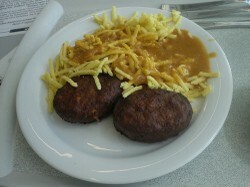 Jaegerschnitzel - what is it? Breaded or unbreaded? What is a good jaeger sauce recipe? Find answers, pictures, and authoritative info from a native Bavarian chef. chefkeem, Thank you for the backstories, links and product lines. In particular, I appreciate the video and the sound effects. What kind of pretzels do you serve? From the recipe and the video, I imagine that you never had customers experiencing what Mulder and Scully went through when they didn't like the food and didn't tip the chefs in the 11th season of X-Files. p.s. I hope the crumbs from writing with a full mouth don't get in the way of your reading this ;-D.
I had quite a bit of German, in fact Bavarian, food when I was growing up, but I have not tried these. My grandmother on my mother's side was from German heritage. Some of my ancestors were from Bayern. This looks like something I would really enjoy. I do make burgers by hand rather than buying them so this looks like a great recipe to try. I often write with a full mouth - I'd better mind my manners! Your burger recipe looks divine. When we get the BBQ out this spring, I'd like to give it a try. By the way, thank you for giving my article the Editor's Choice Award! I am flattered, as it is my first article on Wizzley! Burgers are my favorite red meat. This recipe looks fabulous! Haven't tried making burgers with mustard, but it sounds great! You have inspired me for tomorrow's lunch. My children are very grateful to you! The Classic German Cookbook uses step by step instructions and 300 photos in order to make 70 traditional recipes from Austria, Czech Republic and Slovakia, Germany, and Hungary.